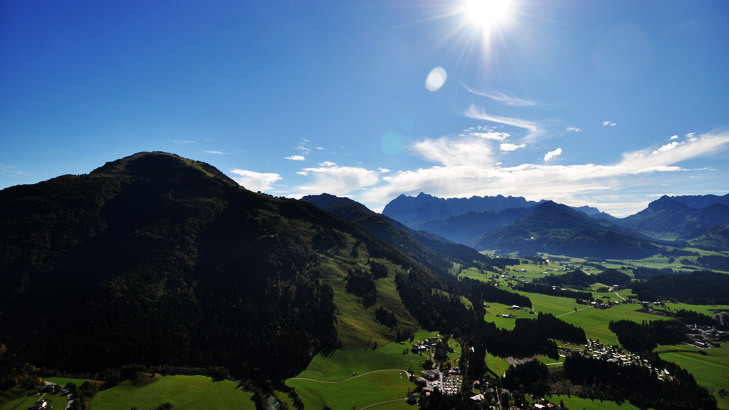 The village Kössen, and the Unterberghorn are known as flying hot spots. Paragliders and hang gliders alike come to these villages to take advantage of the great flying conditions, easy launching, and the flying culture. The launch site is at the top of a chair lift near the Bärenhütte (Bear Hut) at 1480m. The Bärenhütte is open the entire season and has a large deck and chairs to enjoy the sun. Near the peak is the Gipfelhaus (Peak House) at 1650m and is accessible in approximately 30 minutes from the top of the chair lift. This is a local tip for those that want to escape the crowds. Where can I drink my "Victory Beer"
Near the chairlift, you will find Siggi's Sportklause, and a well earned meal. This restaurant stands out because of its great location near the landing zone, and of course because of its food. The landing site for all tandem flights in next to the small chapelle and the memorial stone. Your viewer can see you landing on the field of gras. Afterwards we will go to Siggi's Sportklause and watch you photos and videos taken during the flight.